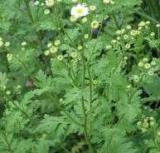 Parthenolide is the main extracts of sesquiterpene lactone isolated from medicinal herbs such as feverfew (Tanacetum parthenium). Sesquiterpene lactones (SLs) are plant-derived compounds often used in traditional medicine against inflammation and cancer. Sesquiterpene lactones (SLs) in clinical trials are artemisinin, thapsigargin and parthenolide and many of their synthetic derivatives. These drugs are selective toward tumor and cancer stem cells by targeting specific signaling pathways, which make them lead compounds in cancer clinical trials. Parthenolide has been used conventionally to treat migraine and rheumatoid arthritis for centuries. Recently it has been reported that Parthenolide may induce inhibition of proliferation and apoptosis in various human cancer cells in vitro, such as colorectal cancer, pancreatic cancer, hepatoma, leukemia and cholangiocarcinoma. In addition, Parthenolide can sensitize resistant cancer cells to anti-tumor agents, and act as a chemo-preventive agent in an animal model of UVB-induced skin cancer. Meanwhile data have showed that Parthenolide-induced apoptosis is associated with inhibition of transcription factor NF-kB (nuclear factor-kappa B), STAT-3, reduction in MAP kinase activity, increase the TRAIL-mediated degradation of the antiapoptotic protein XIAP (X-linked inhibitor of apoptosis) through JNK, mitochondrial dysfunction and increase of reactive oxygen (ROS). What made sesquiterpene lactones reach cancer clinical trials? Parthenolide induces proliferation inhibition and apoptosis of pancreatic cancer cells in vitro. A novel combination therapy with arsenic trioxide and parthenolide against pancreatic cancer cells. Parthenolide, a sesquiterpene lactone from the medical herb feverfew, shows anticancer activity against human melanoma cells in vitro. Resistance of cholangiocarcinoma cells to parthenolide-induced apoptosis by the excretory-secretory products of Clonorchis sinensis. Susceptibility of cholangiocarcinoma cells to parthenolide-induced apoptosis. Parthenolide induces significant apoptosis and production of reactive oxygen species in high-risk pre-B leukemia cells. Parthenolide-induced apoptosis in multiple myeloma cells involves reactive oxygen species generation and cell sensitivity depends on catalase activity. A potent apoptosis-inducing activity of a sesquiterpene lactone, arucanolide, in HL60 cells: a crucial role of apoptosis-inducing factor. Antitumor agent parthenolide reverses resistance of breast cancer cells to tumor necrosis factor-related apoptosis-inducing ligand through sustained activation of c-Jun N-terminal kinase. Involvement of proapoptotic Bcl-2 family members in parthenolide-induced mitochondrial dysfunction and apoptosis. Critical roles of intracellular thiols and calcium in parthenolide-induced apoptosis in human colorectal cancer cells. Oxidative stress-mediated apoptosis. The anticancer effect of the sesquiterpene lactone parthenolide. When DNA is severely damaged, various nuclear enzymes are activated which result in apoptosis and programmed cell death. The famous tumor suppressor p53 is a key player in the DNA damage response, and the precise regulation of p53 is critical for the suppression of tumorigenesis. DNA damage induces the activity of p53, via damage sensors such as ATM (ataxia telangiectasia mutated) and ATR (ataxia telangiectasia-related), which leads to the transcriptional regulation of a variety of genes involved in cell cycle control and apoptosis. The process of apoptosis prevents mutated cells from proliferating and forming cancers. ATM has a central role in coordinating DNA damage responses, including cell-cycle checkpoint control, DNA repair and apoptosis. ATM activates a number of pro-death pathways, including those controlled by the tumor suppressor p53. Mutations of the ATM enzyme are correlated with the development of many different forms of cancer. Several Histone deacetylase inhibitors (HDACi) are in clinical trials. One limitation of present HDACi is their nonspecificity, affecting many HDACs with similar effectiveness. Recent reports suggest a critical role of histone deacetylase 1 (HDAC1) in the development of cancer through the interactions with transcription factors, whereas HDAC3 functions in cell adhesion and migration. Thus, HDAC1 enzyme needs to be inhibited in order to control cancer cell growth and development. Parthenolide activates the ATM enzyme, which results in the depletion of the histone deacetylase 1 (HDAC1) from the cells and cell death through the DNA-damage-transducer ATM. Modulating cellular HDAC protein levels with parthenolide provides an alternative approach to specific HDAC inhibition and effective cancer treatment. Phosphorylation of ATM by Cdk5 mediates DNA damage signalling and regulates neuronal death. The p53 response during DNA damage: impact of transcriptional cofactors. The ATM-dependent DNA damage signaling pathway. Type-specific roles of histone deacetylase (HDAC) overexpression in ovarian carcinoma: HDAC1 enhances cell proliferation and HDAC3 stimulates cell migration with downregulation of E-cadherin. Role for histone deacetylase 1 in human tumor cell proliferation. Parthenolide specifically depletes histone deacetylase 1 protein and induces cell death through ataxia telangiectasia mutated. Moreover, parthenolide triggers cancer stem cell-specific apoptosis and as such represents a potentially important new class of drugs for cancer stem cell-targeted therapy. parthenolide can kill cancer stem cells and not normal cells. Effects of the sesquiterpene lactone parthenolide on prostate tumor-initiating cells: An integrated molecular profiling approach. An orally bioavailable parthenolide analog selectively eradicates acute myelogenous leukemia stem and progenitor cells. Molecular biology of breast cancer stem cells: potential clinical applications. NF-kappaB pathway inhibitors preferentially inhibit breast cancer stem-like cells. Cancer stem cells (CSCs) are responsible for the origin of many cancers and their ability to become drug resistant and spread throughout the body. Current cancer therapies don’t target cancer stem cells, only the cancer cells that are generated by them. The cancer stem cells lay dormant while the cancer cells are killed. Later, sometimes years later, the cancer stem cells begin to self-renew and differentiate into malignant cells, causing a recurrence of the disease.If the cancer stem cells could be sought out and eliminated from the body, the cancer could not re-grow. One of the main challenges in cancer biology is to identify cancer stem cells and define the molecular and genetic events required for transforming normal cells into cancer stem cells. Understanding the cancer stem cell. The leukemic stem cell niche: current concepts and therapeutic opportunities. Insights into the stem cells of chronic myeloid leukemia. Critical molecular pathways in cancer stem cells of chronic myeloid leukemia. Targeting the acute myeloid leukemia stem cells. Leukemia stem cells in acute myeloid leukemia. Hematopoietic stem cells are primarily involved in pathogenesis of chronic lymphocytic leukemia. Parthenolide shows very strong anticancer activity against leukemia cells. Study showed that low concentrations of parthenolide killed leukemic stem cells while having no affect on normal stem cells. Parthenolide can be considered a promising leukemia stem cell targeted therapy. Myeloperoxidase expression as a potential determinant of parthenolide-induced apoptosis in leukemia bulk and leukemia stem cells. The sesquiterpene lactone parthenolide induces selective apoptosis of B-chronic lymphocytic leukemia cells in vitro. 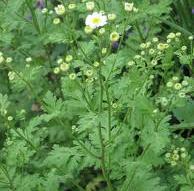 Feverfew: weeding out the root of leukaemia. The sesquiterpene lactone parthenolide induces apoptosis of human acute myelogenous leukemia stem and progenitor cells. Preferential induction of apoptosis for primary human leukemic stem cells. The NF (Nuclear factor)-kappaB inhibitor parthenolide interacts with histone deacetylase inhibitors to induce MKK7/JNK1-dependent apoptosis in human acute myeloid leukaemia cells. Study shows that parthenolide’s ability to inhibit NF-kappaB activity was enhanced by a NSAID (non-steroidal anti-inflammatory drug). Parthenolide and Sulindac (NSAID) are synergistic in growth suppression in pancreatic cancer cells. Parthenolide and sulindac cooperate to mediate growth suppression and inhibit the nuclear factor-kappa B pathway in pancreatic carcinoma cells. Unfortunately dietary Feverfew extracts in supplement form didn’t help cancers due to very low content (0.5-0.8%) of parthenolide. Moreover, there are several pharmacokinetic studies about parthenolide’s extremely low solubility and bioavailability, which means that most of what we swallow goes directly into our gastrointestinal area and is expelled. Very little remain in the bloodstream about an hour or so after ingestion. Study showed that parthenolide, at a concentration of 250 microM, demonstrated substantial linear transport across the monolayer. Transport of parthenolide across human intestinal cells (Caco-2). However, ButturZym contains high purity parthenolide. ButturZym is the one and only product in the world that has perfect bioavailability of parthenolide enough to induce apoptosis in cancer cells. Otherwise, parthenolide wouldn’t have worked against cancer and leukemia. ButturZym is an extremely potent anticancer supplement.